Using an ingredient as exotic as saffron to create light, puffy and syrupy doughnuts. India has a whole genre of sweet desserts, which were once made in the home, but are now mostly made by specialised halvaies – Indian patissiers. 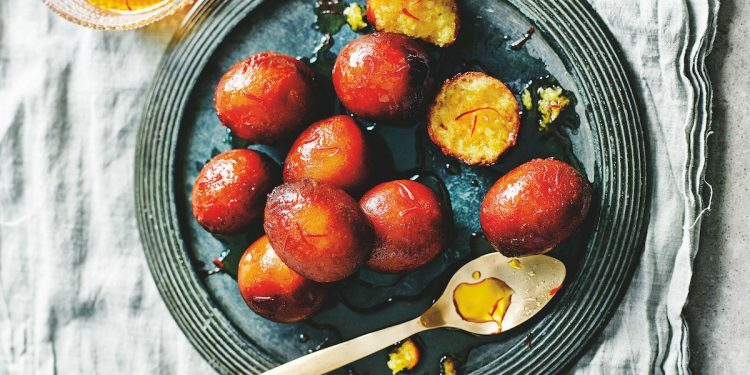 One of India’s favourites, Gulab Jamun, are little syrupy doughnuts made from thickened milk (for a more puffier consistency) and then soaked in sugar syrup. 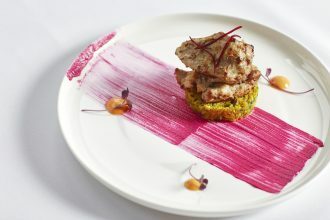 Indian Chef, Anjum Anand, has thankfully provided Hunter and Bligh readers with her delicious Sticky Saffron Dumplings recipe. Considering how temperamental doughnuts are to create at home, Anjum says that there are only two tricks to making these doughnutty dumplings: the dough needs to be the right consistency (not too soft and not too hard) and ensure that you’re frying over a low heat so that they cook all the way to the centre (stirring the oil continuously so they brown evenly). Mix together the dry ingredients for the dumplings. Spoon in the ghee, yoghurt and milk. Mix well with your hands and bring the dough together; it will be moist. Set aside. For the syrup, heat the sugar, water and saffron together in a saucepan, stirring to help the sugar dissolve. Once boiling, simmer for around 3 – 4 minutes, and then turn off the heat. Add the rose water, using the smaller amount first and tasting until you have a strength you prefer. Divide the dough n half. Wet some kitchen paper and place on top of the dough you aren’t working with. Grease your palms well with ghee, take half the dough and form into 9 small balls; Anjum prefers to make them slightly oval rather than round, but you can shape them, as you like. The surfaces should be smooth and crack-free. (If the dough is too soft to shape, add a little milk powder). Repeat to make the shape and remaining dumplings. To check if the oil is ready, put a tiny pinch of the dough into the oil. It should only sizzle very slightly. When it is ready, add the balls in batches so as not to crowd the pan, stirring the oil as you put them in. Cook over a gentle heat, stirring and turning them very often for even browning, they should take 15 – 17 minutes per batch to reach a lovely golden brown. Once done, take them out with a slotted spoon and place straight into the syrup. Repeat with the next batch. Cover and leave to soak for 2 hours, or overnight, in the fridge. They should last 10 days or more. Serve as they are, or sprinkle them with sliced pistachios. Serve as is or with ice cream. Makes 18.